Winsor & Newton has always been at the core of the artistic universe, whilst Sonia Rykiel has been at the core of the French fashion community since it was founded in Paris in 1968. So it’s no surprise that Sonia Rykiel chose to partner with Winsor & Newton to bring their famous Saint-Germain store to life for their 50th anniversary celebrations. Kicking off with an event in their Paris flagship store on 16th January, Sonia Rykiel is hosting a programme of cultural, philosophical and literary events called ‘Manifesto’. For the premier event in Paris, over 2,000 Winsor & Newton ProMarkers have been co-branded, and will be available to the public, so that they can embellish the walls and façade of the flagship boutique. 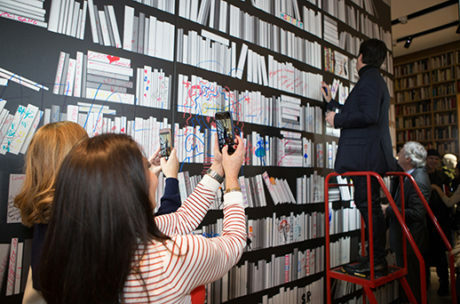 This unique installation representing blank bookshelves will allow the public to express their art on the book spines with words and drawings inspired by Rykiel. Seven Winsor & Newton ProMarkers colours have been selected by the Art Director Julie de Libran: Hot Pink, Carmine, Sunflower, Marine, Royal Blue, Crimson and Black. 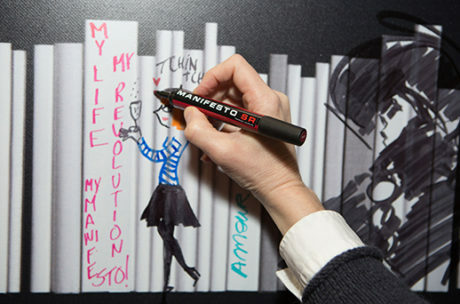 The co-branded ProMarkers have been sent all over the world to the Sonia Rykiel boutiques, for the worldwide launch of Manifesto. 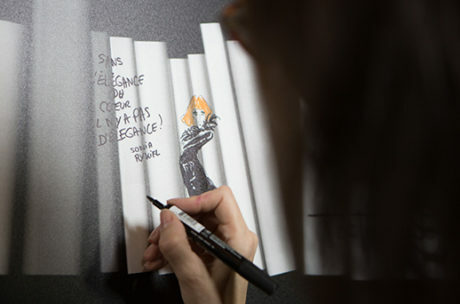 At the Paris event illustrators, authors, artists and fashion designers held our co-branded ProMarkers in hand and let their creativity flow through them onto the walls to allow them to be both the artist and the author. Fabienne Legrand drew a tribute to Sonia Rykiel celebrating her 50th anniversary in her celebrated style. 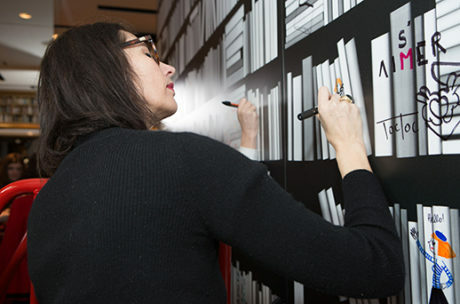 Below are a few snaps of Fabienne working on her drawing at the event. Also in attendance were, Jean-Charles de Castelbajac, Emmanuelle Teyras, Sibylline Meynet, Leona Rose, Carlotta Saracco, and Audrey Leroy. The event was inspired by the Sonia Rykiel flagship store on 175 Saint-Germain in Paris. the interior of this unique space is encased with bookshelves filled with books Sonia admired by literary greats, such as Victor Hugo, Émile Zola, and Jean-Paul Sartre. Saint-Germain-des-Prés was once the creative hotbed of Paris, where philosophers and writers met in the many literary cafés that dotted the area. 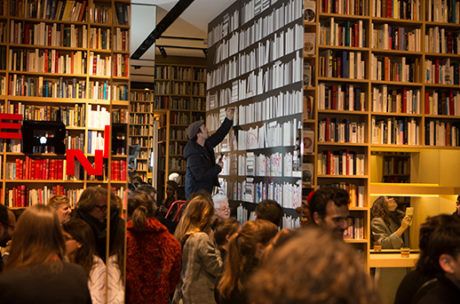 In 2015, Julie de Libran, Sonia Rykiel’s new artistic director, collaborated with director and publisher Thomas Lenthal and artist André Saraïva to bring literature back to Saint-Germain-des-Prés. The Winsor & Newton ProMarkers are ideal for colouring. Their alcohol-based non-toxic inks allow a uniform and perfect application at every use. Available in 148 hues, ProMarkers have an unbeatable performance. The Winsor & Newton ProMarkers have two tips: a fine one and a large one. The fine tip is ideal for details and lines. The large tip is great to create quick visuals and fill large zones. The nearly instant dryness allows to create layers on top of each other to create sharp and clean colours. In 2017, the BrushMarkers were added to the line, with a newly developed multi-purpose tip: It brings more precision and a perfect control of lines. Find out more about ProMarkers on the Winsor & Newton website.